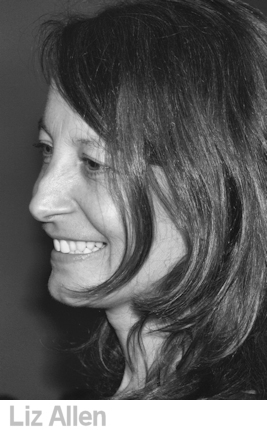 Liz Allen is a British independent filmmaker currently based in Sydney. She specialises in off-beat character driven documentaries on national and international topics. Curiosity drives Liz into unfamiliar environments. She loves to be able to immerse herself in order to gain the trust of her subjects. Examples of her work are ‘Parking Mad’, ‘15 Stone Babies’, ‘Inside John Lewis’ and ‘Silverville’ all appeared on BBC, Channel Four, ITV, UKTV, ABC, ABC2 and elsewhere internationally. Where did your interest in documentaries come from? I was always interested in story telling and had my own radio show when I was a child. I got my first camera when I was 15 and started to explore the visual arts. I was an ambivalent student and instead of following a creative path I decided to follow my sister into nursing. However, I realized I was more interested in anthropology than medicine so I left and started redirecting my education and career towards filmmaking. As a nurse I wanted to make a difference but I also wanted to do something that had a greater scope than that, something that could reach a greater audience. Nursing gave me great training in listening and drawing people out and letting them tell their own stories. Do you have a formal education in filmmaking? I studied photography, film and journalism and although I loved those disciplines I fell in love with documentary. I wanted to be honest in my story telling and disliked anything that was contrived which is why I became an observational filmmaker. The documentary course at Bournemouth sealed my determination to make films about ‘silent’ communities. My short films were character driven films; One about female boxing and the other female sexuality called ‘Thanks for Coming’! Bringing out humour in films is also very important. How did you get on the filmmaking ladder? What do you think was your big break? I eventually joined the BBC in the year 2000 and started as a researcher on the landmarks documentary series ‘Child of Our Time’. There I learnt the art of story-telling, filming and also created 3 minute VT’s for prime time shows such as ‘Animal Hospital’s. I progressed from making 3-minute films to 5-minute to eventually 30 minutes. However, is it ideas that make or break you. I developed two ideas, which were nominated for a Royal Television Society award. ‘Sins of the father’ was a 60-minute documentary about a man whose son was imprisoned for murdering 2 old-aged pensioners. ‘Breast Cancer; the operation’ was a 3 hour film about the killer disease which won an RTS. How has your filmmaking and style progressed throughout your career? I do have a certain style which I call intimate. It is not strictly observational but it is a huge part of it. I shoot a lot and am sometimes ‘there’ pushing the storytelling forward with my questions. I want to get close to my characters and peel off their layers, trying to understand what makes them tick and all of that takes time. I also look for humour and try to bring out the light and shade of any subject matter. I think my style has got a little more sophisticated but in essence it's the same. My priority has always been the character and my relationship with that person – sometimes the technical side of my filmmaking becomes less important which is why working with a camera-person is best. When I am in the cutting room I am more playful with music and cut faster than old-school documentary makers. In the past I used to generate a lot of my own ideas but currently I have a reputation so often people come to me with the idea and subject. In the Industry nowadays it’s sometime easier to accept a film that has already been commissioned rather than wait to get your own idea commissioned, which could takes months. When I was in the UK I decided to work for well-respected Indies who constantly invested in development. What motivates you to make your documentaries? My main motivation is whether I can bring something unique to this subject matter. If it is difficult access then I know I gain that trust by using my skills and experience. I love bringing something to the screen which has in the past been hidden, I love to peel back the layers and give a voice to those who are silenced, from immigrants to old people to adult babies. I get a real buzz from creating something that people actually want to watch and who get absorbed into my film. Can you explain a typical project journey, from finding a subject through to handing a series over for broadcast? It depends often where the seed of the idea has come from. ‘Sins of the Father’ was developed after I heard Roger Aston on the radio talking about his son. I phoned and interviewed him from which a treatment was written. I was in-house at the BBC at the time so it was commissioned very quickly. Nowadays commissioners also want evidence of the characters on tape so often you may have to film something and create a taster tape which shows the type of characters in the documentary. There are number of documentary festivals where filmmakers can pitch to get money to make a film. I have never done it but the Meet market at Sheffield and the forum at Amsterdam are great opportunities to generate funding. In Australia where there is less money sloshing about many producers get funding from philanthropic organizations or from people who have enormous wealth. No documentary maker works alone, it is always a team effort. I enjoy collaboration however when necessary for access or for intimate sync I will work alone. Sometimes having a second person spoils the relationship you have with your contributor and can breaks the trust you have with them. Someone once said to me to if I could make humour out of poverty (but not in a patronizing or voyeuristic way) then I was doing a good job. The worst part of the job for me is when the commissioner comes in for the first viewing. Sometimes, even though they have worked closely with us, their expectation might be very different from what is delivered. It is especially awful when the commissioner is new and they don’t know the film at all. That can be disastrous! For me, the most joy I get from the process is when I manage to gain the trust of someone and they’ve agreed to be part of the film. Also, when I hit gold by filming something or somebody and I know that it will make an integral part of the documentary. What advice do you have for anyone wanting to make a career out of documentary filmmaking? If you have an idea with strong characters and a good story then you have hit gold. Where this idea sits is also another question: is this a feature documentary or a TV hour or an on-line documentary? There are also subtle differences in criteria but ultimately if it’s a great idea, which has a contemporary heart, then any platform will do. For a documentary to succeed the last ingredient would be passion – passion for the subject and characters are key and a curious mind. What’s the future of Documentary filmmaking? There are two sides to this question. In some ways the documentary industry is as healthy as ever. The Internet has opened up a whole new world of on-line publishing creating many more platforms for documentaries. On the other hand there is less money around. In the UK, television, is still the main commissioning area, although the budgets have got smaller and smaller and the single 60 minute documentary are difficult to get commissioned. Then, there is the festival documentary circuit, where the funding is even tighter. However, with less money about filmmakers have to be more creative and find ways to tell a good story without losing the production values. That’s the challenge but it’s also really exciting. I was in Australia when I got the phone call over a year ago asking me if I wanted to come back and direct this film. They were looking for someone who could capture a side of Andrew Marr that’s not been seen on TV before. For many years Andrew has been interrogating the famous and delivering pieces to camera, but not this time. Instead of being the interviewer, he had to answer my questions, some of them personal, about his recovery from a major stroke four years ago. It certainly took a while for him to get comfortable being on the receiving end of an interviewer like me. I wanted to do more than take Andrew into hospitals and laboratories, I wanted to find out what made him tick. I needed to build trust and shoot in a style that was unfussy and intimate. We were a tiny crew, just myself and an AP on sound. I shot on a FS7 as unobtrusively as possible and that way we got excellent access. Andrew’s life is in the public eye, but his family do not share his love of the spotlight. It took over six months of gentle persuasion and building up trust to persuade his wife, journalist Jackie Ashley to go on camera. Andrew himself was initially wary; he didn’t want the audience to pity him, nor did he want to come over as arrogant about his recovery. Time and patience is needed if you are going to get something on screen that doesn’t just skate along the surface; because we kept our production costs low, we could spend nine months making the documentary. 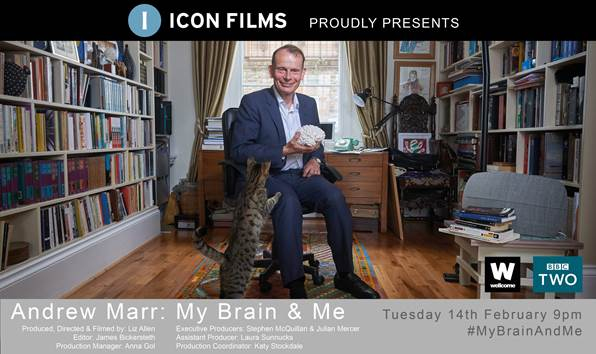 For a limited time Andrew Marr: My brain and Me will be available on BBC iPlayer here. Telegraph review of Andrew Marr: My Brain and Me. Guardian review of Andrew Marr: My Brain and Me. Guardian review of 15 Stone Babies. This article was updated in February 2017 to include a section about Liz's latest work, Andrew Marr: My brain and Me. © 2015-2016 Peter Hatter Photography Ltd. All rights reserved.